You'll be £19.99 closer to your next £10.00 credit when you purchase Lady Death. What's this? The wartime memoir of Lyudmila Pavlichenko is a remarkable document: the publication of an English language edition is a significant coup. Pavlichenko was World War II's best scoring sniper and had a varied wartime career that included trips to England and America. In June 1941, when Hitler launched Operation Barbarossa, she left her university studies, ignored the offer of a position as a nurse, to become one of Soviet Russia's 2000 female snipers. Less than a year later she had 309 recorded kills, including 29 enemy sniper kills. She was withdrawn from active duty after being injured. She was also regarded as a key heroic figure for the war effort. She spoke at rallies in Canada and the US and the folk singer Woody Guthrie wrote a song, 'Killed By A Gun' about her exploits. Her US trip included a tour of the White House with FDR. In November 1942 she visited Coventry and accepted donations of £4,516 from Coventry workers to pay for three X-ray units for the Red Army. She also visited a Birmingham factory as part of her fundraising tour. She never returned to combat but trained other snipers. After the war, she finished her education at Kiev University and began a career as a historian. She died on October 10, 1974 at age 58, and was buried in Moscow's Novodevichy Cemetery. Lady Death is fascinating, and Pavlichenko’s beliefs don’t change her real accomplishments. This is a book worth reading. 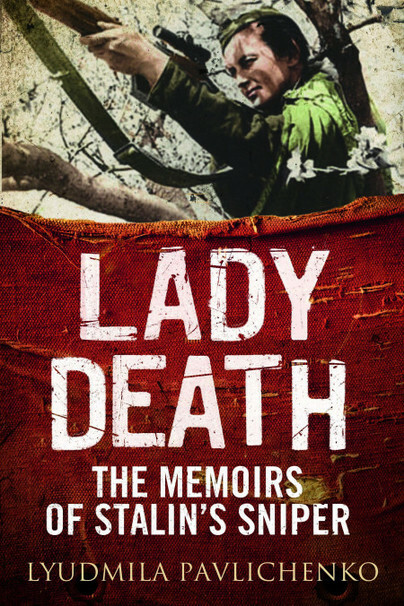 Anyone, whether a scholar with an interest in the Russian Front, the Red Army, or sniping, or the layman curious about these subjects, will find Lady Death, a volume in the “Greenhill Sniper Library”, valuable and informative reading. ★★★★★ She was a no nonsense, formidable lady. ★★★★ This book transports you in time to Russia in World War 2 and it is interesting to learn what Pavlichenko thought in some situations and what was life like in general. ★★★★ I warmly recommend this book to fans of history. ★★★★★ ...very well written. I would have to say this is one of the top five books I've read in my fifty years of life. This book is a masterpiece of literature. To such a life the literary quality should be exceptional and it is. This is a book you want to read over and over. As featured in part of 'The Women Behind the Gun: Soviet snipers' article. Lyudmila Pavlichenko was one of the top scoring snipers of World War II with 309 recorded kills. She died on October 10th 1974. Charles Henderson, Mark Spicer, Martin Pegle, Charles Strasser, Tom McKenney, Adrian Gilbert, Leroy Thompson, Harold Robbins and Roger Moorhhouse on Simo Haya.